For most people, seafood is simply a protein either on a menu, laid across some ice in a display case or pre-packaged in a box at a supermarket. There’s typically no story about where and how the fish was caught, much less by whom. Consumers have little or no idea of how far the fish has traveled, nor whether the fish and shellfish are abundant, stressed or fed antibiotics and hormones at an industrial aquaculture site. 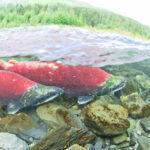 One Fish Foundation arose from a wish to spread the word about our relationship to oceans and specifically to seafood. This means bringing the story behind the seafood we eat into classrooms. I’ll lug in a bunch of fishing gear to talk about different harvest methods and their impact on the resource and marine ecosystems. I’ll throw out eye-popping stats to illustrate how skewed our domestic seafood consumption picture is. Spreading the word also means going into communities and having conversations with people who care about the environment and want to learn more about the food they eat. That’s what the Know Fish Dinner Series is about. 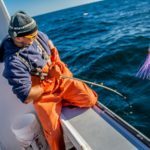 For the past five months, I’ve worked with Seacoast chefs who are passionate about sourcing sustainably harvested seafood; activists who speak out on issues like fisheries management fairness and climate change; fishmongers selling locally abundant, underutilized species; and one fisherman who is bucking the trend toward consolidation, resource depletion and massive bycatch. We’ll have some fun with trivia that sheds light on the resource, the supply chain, marine ecosystems, aquaculture, invasive species, climate change impacts and more. We’ll discuss these topics, ask and answer questions, and bring more of the story to life. This will be your chance to talk to Capt. Rider about why he spends 18 hours a day or more on the water, fishing with rod and reel in a fishery dominated by trawl nets. You’ll have the opportunity to talk with chefs Evan Mallett of Black Trumpet, Rob Martin of When Pigs Fly and Brendan Vesey of Joinery Restaurant (Brendan will be cooking with Evan at the Black Trumpet event) about how they choose what seafood to put on the menu. 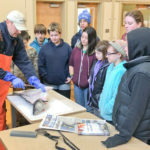 You’ll be able to ask fishmongers Spencer Montgomery of Dole and Bailey and Amanda Parks of New England Fishmongers about the products they market and handle, and some of the discussions they’ve had around underutilized species. Got questions about why many small-scale fishermen are struggling? Follow up with one of the event collaborators, Brett Tolley, the community organizer and policy advocate for Northwest Atlantic Marine Alliance. He’s been at the forefront of a campaign to revise current fisheries laws that are consolidating the fleet and squeezing out fishermen like Capt. Rider. (And, I’ll be on hand to talk about sparking student interest in seafood sustainability, and the effectiveness of waving a dead fish at 6th graders). This is the team that has volunteered many hours to help organize these events. Everyone brings a great energy and passion to the dinners on Oct. 13 at When Pigs Fly and Oct. 27 at Black Trumpet. So come out and eat some fabulous seafood, listen to some cool stories, test your seafood trivia, and most of all, get to know your fisherman, your fishmonger, your chefs, a couple of evangelists and your FISH. Get tickets via the links below. Next Post	What’s in This Fish? Students loved working with Colles and learning about the mission of the One Fish Foundation. They acquired valuable understanding about sustainability and are now educated, knowledgeable consumers. 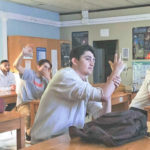 The lessons connected to many of our curriculum standards, and months later, students are still making connections to these real-world lessons.